Place the cilantro, parsley, garlic and red pepper into a blender or food processor. Add the lime juice and oil. Cover and blend until the mixture is smooth. Mix the beef and sausage in a large bowl. Season the beef mixture as desired. 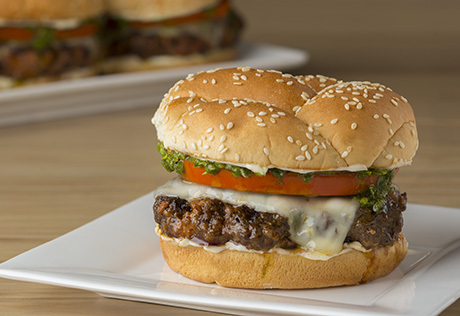 Shape the beef mixture into 4 (4- to 5-inch diameter) burgers. Cook the burgers in a grill pan or 12-inch skillet over medium-high heat for 5 minutes on each side or until cooked through. Place 1 slice cheese onto each burger during the last minute of the cooking time. Spread the mayonnaise on the cut sides of the buns. Top with the burgers, cilantro mixture and tomato slices. For extra heat, top the burgers with fresh jalapeño pepper slices.